I have very recently launched Elixa Probiotic V3 after extensive early user trials and feedback. The early results for V3 have been extremely positive and a succinct way to summarize them—for people familiar with Elixa—is that this is an improvement upon both V1 and V2 combined. There were, after all, a few people who responded better to V1 than to V2. Well now, V3 appears to be superior for both groups that have tried it thus far. Better than V2 for those who responded best to V2, and better than V1 for the smaller portion who preferred V1. For newcomers to Elixa, an explanation of our technology can be found in the V2 update article. There is also a video. The changes for V3 have been steered by whichever of the V3 trial blends gave superior results, rather than being a prediction. Now that my company has grown, I’m able to afford to produce batches purely for purposes of early trials, which allows me to ‘A/B test’ blends. The final launch version of V3 was the one that performed best after a few iterations of such testing. With the upcoming release of Tribal Prebiotic (which is progressing nicely through a few extended trials I decided to run in order to make sure the launch goes well) many people will be consuming a defined set of prebiotics that I can account for. I have tailored the V3 blend to contain species that I think will work best, with those substrates in mind. The early results from V3 have all come from users who have taken it without Tribal Prebiotic, and there is in no way any requirement to use Tribal alongside Elixa. Certain species are less sensitive to their own metabolic byproducts. When you culture bacteria, a primary objective is to remove their outputs to maintain optimal conditions, such as removing an acid/alkali byproduct to maintain pH. An analogy: As humans, we exhale air with a higher concentration of CO2 (Carbon Dioxide) and less O2 (Oxygen) than the air we breathe in. If we did this in an air-tight environment, the CO2 would gradually increase and the O2 would decrease until we could not survive on that air any longer. Extracting CO2 and replacing O2 into that contained atmosphere would solve the problem. Recall the ‘duct-tape scene’ in the film Apollo 13. That’s the same thing with removing byproducts when culturing bacteria. You don’t want them to poison themselves with their own waste. And ideally, you don’t even want them to reduce their conditions from optimal (for proliferation). The species that are less sensitive to minor fluctuations from optimal conditions can be produced at a higher concentration: i.e., the final lyophilised powder will have more bacteria per gram. Using this fact, I have biased the species selection towards these higher CFU/gram species which has resulted in a higher number of CFUs per capsule. In other words, the dose is now more potent. Lastly, the actual species themselves have seen a return in numbers of a couple of the Lactobacillus species that I’d previously culled from the V2 blend. This has been based on my growing appreciation for incidence rates of small intestinal involvement in dysbiosis. I have also entirely removed some species which, at this time, I do not think are contributing enough to the overall benefit of the product on a comparative per CFU basis. In other news, I’m extremely happy to get my Gut Health video series rolling! The first episode can be found here and will explain the direction I’m going. And you can watch episode 2 right here. What are people saying about Elixa? Last July, I published some testimonials from Elixa customers. Here’s a second round. “Thank you for going the extra mile with my order. “I just want you to know that Elixa has been life changing for me. I am 58 years old and have metabolic disorder. This will be the third time this year I’ve done a 24 day course. Each time I recover a new level of health. “I’m still eczema free 1 year later. If I feel a tingle, just do a 6 day. No more supplements needed. “Could not be more appreciative! “My results are nothing short of a miracle so I’m happy to help in any way I can. Spread the love. “Hello Karl. My husband [Mr R] wrote you about my ability to wean off Nexium 40 mg/day (2wks & 1 day so far), which I’ve never been able to do. I held off writing you about my results because I wanted to get to 3 months or longer before sharing. Meanwhile, I am thrilled to avoid the daily purple pill & the possible long-term health consequences from taking it. In the past 2 weeks, I have had a little nausea, but I even had occasional nausea when I was on Nexium. Not sure why and am hoping it will go away over time. I will choose to live with a little nausea over taking Nexium. “Meanwhile, here’s some history. Growing up, I rarely experienced typical GERD/heartburn & didn’t have a stomach ulcer. As a young kid, I thought I was born with really bad allergies, a very sensitive stomach, and fatigue. So, I took lots of allergy meds, antidiarrheals, and then Mucinex in later years for heavy chest congestion & mucous in my throat. In 2007, I got tired of feeling so sick and tired, and was finally diagnosed with the LPR type of Reflux by an Otolaryngologist & then had an upper endoscopy later on. Once I began taking Nexium, I started feeling wonderful & rarely ever had to take allergy, antidiarrheals or Mucinex meds. However, I also significantly adjusted my diet and stopped eating the usual trigger foods like tomatoes, citrus, chocolate, garlic, onions, and limit yogurt (use Lactaid pills) as I’m lactose intolerant. I still drink a touch of coffee but even less so the past couple of weeks because I want to optimize Elixa success. “With the continuing news of possible bad consequences with long-term use of Nexium, I met with different gastroenterologists over the past few years to try to wean off the PPI. I never succeeded even for a day with reducing Nexium to 20 mgs. The docs didn’t like the surgeries available to fix reflux because they do not seem to be successful long term & may have some bad consequences. as I have RA, I went and searched on my ubiome report for Lactobacillus. In June 2015 I had .06 and I guess for my recent October 2016 it was too low to report. I then checked on the back of the Elixa package, I was happy to see that Lactobacillus Reuteri was in the formula. I am on day 2 and am not expecting any miracles but am curious. I had bought 2 boxes for my husband when he had his appendectomy. My Bifidobacterium is very good. Now how to work on Lactobacillus (Reuteri)!? As soon as I start my last 6-day box of V2 I’ll place an order for the V3. After the holidays are behind us my wife and I will want to “reset” our guts. As I type this I am eating a bag of homemade cranberry & white chocolate cookies. Yes, they are terrible for me. But yum. Richard or anyone else who has tried this; any reports on help with balancing food intolerances (not allergies)? I feel like an unhealthy gut must play a role, but have not had any results (positive or negative) with the (many) other probiotics I’ve tried. Thanks! Well, yea, just about everything has been reported. Of course, some have reported some negative experiences and so, not detectable experience at all. All depends on each snowflake. Anyway, in the last post of testimonials, I include a list of all my past posts about Elixa. So, you could check those out and scan through the comments to see what various people have reported. A possible mechanism for food intolerance is the influx of abnormally large/undigested food molecules entering the mucosa or bloodstream due to faulty tight junctions in the intestinal epithelial lining. They can then trigger an immune response now they have escaped the lumen. It depends what your symptoms are and what type of foods trigger it. Any chance you’ll be shipping the Canada (Québec), soon? Shipping to Canada is something I have been working on in the background for a while. A potential Canadian partner who I was in discussions with for a while, very recently became unavailable due to other obligations that arose on her end. I will therefore proceed with things as per the US model I am currently using. This takes longer with Health Canada than it did with FDA. I didn’t respond to either V1 (2 months) or V2 (3 months) – didn’t feel any changes at all. Should I give this a go? In contrast, I always feel the effects (good or bad) when eating even a spoonful of (properly prepared) kefir and fermented vegetables. ? Am I understanding this right? You took about 8 6-day courses of V1 and about 12 of V2 for a total of about 20 courses? I’m really hoping to have a good experience with the Elixa, which I have just started. I had been taking three of the soil-based probiotics you (Richard) recommend (Prescript-Assist, Probiotic-3, and Primal Defense Ultra) together for about 10 days and suddenly realized my asthma had returned and I was having to use inhalers several times a day again. Finally made the connection and started researching, then found an article on PubMed that discussed probiotics causing excess histamine, which may be what has been happening. Then I found this article questioning the safety of the soil-based probiotics (no idea how credible this is, but it’s interesting information hyperbiotics.com/blogs/recent-articles/15994079-the-problem-with-soil-based-organisms-sbos-as-probio… I don’t think Elixa contains any of the strains this author mentions as possibly dangerous ones. And mind you, the soil-based ones may be fine for those starting out with a healthy gut (not the case with me…lifelong allergies and asthma, plus many courses of antibiotics, plus previous bad diets, etc.) So I am rather discouraged. Richard or Duck Dodgers (or anyone), can you shed any light on this? Also, if Karl is reading, can you tell me if any of the probiotics in Elixa are soil-based? Thanks in advance. I can confirm that there are no microbes that would be classified as ‘soil-based’ in Elixa, according to what this (non-specific) term conventionally refers to. I can’t say whether it was the PS or the SBOs that worsened your asthma, but I do know that people have reported increased sinus and breathing problems from PS consumption. It stands to reason that if you possess a small population of pathogens which are causing a problem (such as asthma) then introducing a readily-fermentable substrate into the gut such as RS *may* cause those populations to grow too; not just beneficial populations. When they increase, their detrimental effect would increase. Whether this is related to histamine production or not, is hard to say. I think that if you had a strong positive response to taking anti-histamine medication during these episodes, then it would indicate it was histamine related. Beyond that it could even be a substance within the PS (potatin, etc) that triggers an immune response in the presence of an already-compromised epithelium. How do SBO probiotics fit into all of this? Karl talks a lot about the need for repopulating the gut with beneficial probiotics and the need for prebiotic foods and/or supplements to maintain that desired symbiotic flora later on but no mention of soil based probiotics. 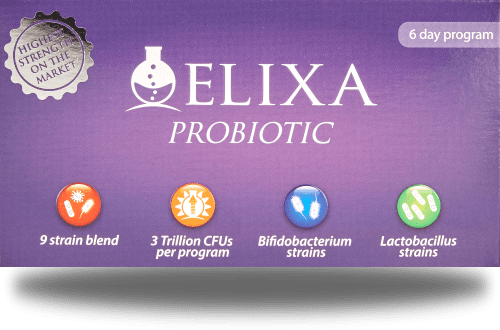 The probiotic blend of Elixa does not contain a singe strand of SBO. And you talk a lot about the benefits and positive effects of the soil based probiotics and from personal experience I share both, the sentiment with you and also with Karl regarding the strains he advocates in his product. So how do SBO and Elixa interplay together, what is the connection? How would a protocol of taking these probiotics look like, is there a need to separate them or do they work better in conjunction with each or are they even antagonistic in some cases? And is there any specificity to the dietary choices for support between these two types of probiotics or do the bugs happily share the same foods? If this has already been addressed before and I missed it I would be grateful for a link. I do not forsee any contraindication between the LAB in Elixa and the SBOs in sbo supplements. Many microbes are able to feed upon the same substrates. Especially ones which require very few (or ubiquitous) enzymes to break down. So for dietary choices I would look from the evolutionary point of view and think about what we were likely to be consuming in any significant amount (fruit and cooked tubers) and the type and amount of fermentable substrate that would result from that. That’s the ideal of a HEALTHY gut. Trying to guess the best diet for an unhealthy gut is very hard. You are basically trying to guess which FODMAPs will NOT feed the pathogenic species in your dysbiotic gut. I think a better strategy is either temporary v.low FODMAP for extreme cases (e.g. you have severe IBS-D and need to catch a breather for a few days), or to consume a natural diet (cooked tubers, fruit) and tackle the dysbiosis at the same time. While a natural diet is fibrous and will feed up good *and* bad, it means that atleast while you are targeting the bad, the fiber foundation will be ever-present for the beneficial microbes to thrive and take over any surface area from which the pathogenic populations are sufficiently evicted. The alternative is you starve them both while tackling the dysbiosis. That’s what the low FODMAP comment would pertain to. So you can starve them both and target the pathogens, or you can feed them both and target the pathogens. Which is superior is up for debate. I’d go with the latter. David F–those are great questions, and I would also like to know the answers and/or be directed to links discussing this. I wanted to add to my previous post (for anyone else who might be dealing with histamine reactions) that I seem to have had no bad reaction to the Elixa, and also, I read that the potato starch may be problematical in terms of histamine, and I had been taking about 6 TBSP of potato starch daily with the probiotics. I read that for someone with sensitivity to histamine, it is preferable to get the RS from foods (I think the banana flour is probably okay to use, as well). If the potato starch was causing the wheezing, then I shouldn’t have blamed the soil-based probiotics, but I would like more information, as David suggested, about the interactions among the SBOs and Elixa, as well as the best dietary choices to support each of them. Until then, I will focus on taking Elixa–it’s hard to figure out possible cause and effect when throwing so many things together. I stopped taking them, as one caused me severe anxiety. Not sure which one, as I would alternate them. Interestingly, I started taking them again this week, as I found an full bottle in my cupboard…and I’m having problems, hip pain…and breathing. I took the first edition of Elixa and had zero response. Didn’t try V2. Interested to try V3. Anyone else have asthma pop up? Any recommendations? No criticisms of Richard, or anyone else. I really would like to fix my breathing. It would certainly be interesting to find out whether SBO probiotics are generating this effect. Please let me know if you do come to further conclusions. Thanks! I really appreciate the personal reply. Glad to know the soil based is not in Elixia. To follow up on the asthma comment. My Dad died January 9th. One more surgical blunder, after a physician error prescription. Anyway, I have just finished cleaning my Dad’s things. He had the 3 recommended SBO probiotics in his drawer, unopened. He did use potato starch regularly, but didn’t take the probiotic. I still have asthma. Still don’t know why. Hopefully it can be remedied. N.
Regarding your asthma: You can be confident that it will be resolved in the near future. It is inevitable with the amount of focus being placed on gut-immune interactions nowadays. I’m new to Elixa, on day 6, testing it against multi-waking insomnia, fatigue, and constant throat clearing without reflux. I completely avoided starches/sugars for the first 3 days, then added cooked/cooled potato and rice. The only change so far is headaches starting day 4. Is there a best way to eat moving forward, to encourage the good guys to multiply like crazy? RS (e.g. in cooked/cooled potatoes) gives some people headaches. Usually just in the beginning. Solutions to this would be switch the source of RS (just in case it really is a glycoalkaloid problem) by opting for Green Banana Flour, Hi-Maize, or some other RS source. OR, you could try inulin instead (starting with a much lower dose compared to RS).